Girl Kuripot Girl Kuripot: Win a 3D2N Trip to Batangas Plus P10K GC! Win a 3D2N Trip to Batangas Plus P10K GC! Have you read about this short post on My Love Affair with Parisian Macaroons? It's Joie de Vivre, French for The Joy of Living. The encounters we have with food that is not our own in Manila is a pleasure that is no longer hard to come by and I often associate them with a place or country even if I haven't been there yet. More often than not, it sets the tone to explore what's out there really and to look forward to that trip one day. 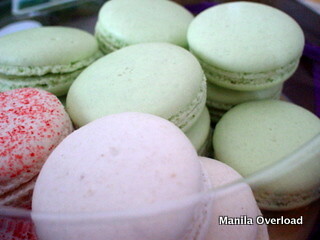 For now, let me give you this (while I stare at my Pistachio Macaroons). Because it is through its customers that a restaurant continues to exist, here is a Bizu treat for 6 people to win a 3D2N luxurious vacation package in Batangas plus P10K worth of Bizu GCs! There will be one winner per category of this photo contest. Just bring out your life's joyful moments with Bizu. 24 Consolation prize winners will also receive P2K worth of Bizu GCs. You can submit up to 2 entries per category. Just head on over to designated Bizu drop centers in Metro Manila on or before October 25, 2011 and by mail for provincial on or before October 31, 2011! Isn't life beautiful? There's so much to celebrate! Cheers to 10 years, Bizu! Click here to know more about the requirements of the Bizu Joie de Vivre Photo Contest. Win a 7D6N Trip for 2 to Brazil! What is Your Dream Trip? Win a Travel Companion! Win a 3D2N Stay for 4 at Be Resorts Mactan! Win an Overnight Marco Polo Stay for 2! Join the Lakbay Norte Contest! Taiwan Film Festival Manila 2011 Schedule! Watch MTV Exit Live in Manila for Free! Watch Tunog Natin! 3 for Free! Win a Trip for 2 to Bangkok or Hong Kong! Join the Best Get-Away Ever Contest Weekly! Win a 2N Stay in Fontana Plus Muzikademy Tickets! Win Stays for 2 in Australia, Four Seasons Hotel! Win Treats from the Filipina Explorer! Win a 3D2N Trip to Japan and Universal Studios! Win a 4D3N Trip for 2 to Hong Kong! Join the Express Your Art Contest! Win an Overnight Stay in Manila! Michelin Philippines, Win 1 of 3 Slots to Race for Real at the Sepang F1 Circuit in Malaysia!